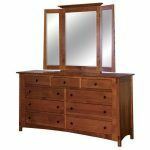 Mission Style Furniture is one of the most popular furniture designs today. But, as its name suggests, Mission furniture has a long history. In fact, the style dates back to Catholic missions which sprung up in the American Southwest. As you might remember from US history, Franciscan missionaries from Spain built adobe-walled missions in California and elsewhere. But what you may not know is that their simplistic building design inspired succeeding generations of artists. In fact, the ‘Mission’ design style began to filter into other fields of design. Such as sculpture, architecture, painting and furniture. Gustav Stickley became the first craftsman to mass-produce and popularize the Spanish Mission style. Over time, the Mission style ethos of simplicity and practicality resonated deeply with the American people. So this threw open the door of opportunity for Stickley. He broaden his Mission furniture line to include naturalistic wicker furniture with rough-hewn wood and bark accents. Also, these new styles perfectly complemented the cleaner, sturdier Mission designs. So where can furniture lovers get the best Mission furniture today? That’s easy. It’s Brandenberry Amish Furniture. This Amish furniture store nestles among the Amish farms and Amish custom woodshops of Northern Indiana. And Amish craftsmen painstakingly craft each piece in their massive lineup of Mission furniture. In fact, the Amish men use traditional, ‘old world’ cabinetmaking techniques. Plus solid Midwestern hardwoods like oak, maple, cherry and hickory. Brandenberry’s collections of Mission furniture include pieces for every room in the house. From bedroom sets to living room pieces. And from dining room collections to full home office ensembles. Also, Brandenberry’s Mission lineup comes in various flavors. They include Mission, Bridger Mission, Classic Mission, Deluxe Mission, Granny Mission, Rio Mission, Royal Mission and Trestle Mission. To see, touch and experience Mission furniture from Brandenberry, visit their ‘brick and mortar’ store in Shipshewana, Indiana. It’s an easy day trip from Chicago, Detroit and Indianapolis.